Clarence Fahnestock State Park, NY, AT NOBO mile 1,419.9, Saturday May 17, 2014 — Swayed and I are tenting in a NY state park not far from New York City on a weekend. Guess who’s on exhibit? Why us of course. “Hey Vinny! Did ya see doz guys?” We being “doz guys.” Actually, if you know how to ‘nice them out’, New Yorkers are pretty good folks. Let’s just say that we’ve been well treated since we’ve been here. Swayed’s British accent helps. We got a late jump on the day being that the shuttle leaves the motel at nine. That’s really late for us. We set our sights on a 20 mile day while Bus elected to stop much shorter. He caught the chest and head cold I’ve been nursing for the past week and is a bit under the weather. We all wanted to see the Bear Mountain Zoo. Within, the bear exhibit is the lowest elevation on the entire AT. Sadly, we were too early. It wasn’t open yet. Every hiker wants to liberate the poor bears. We like them much better outside cages. 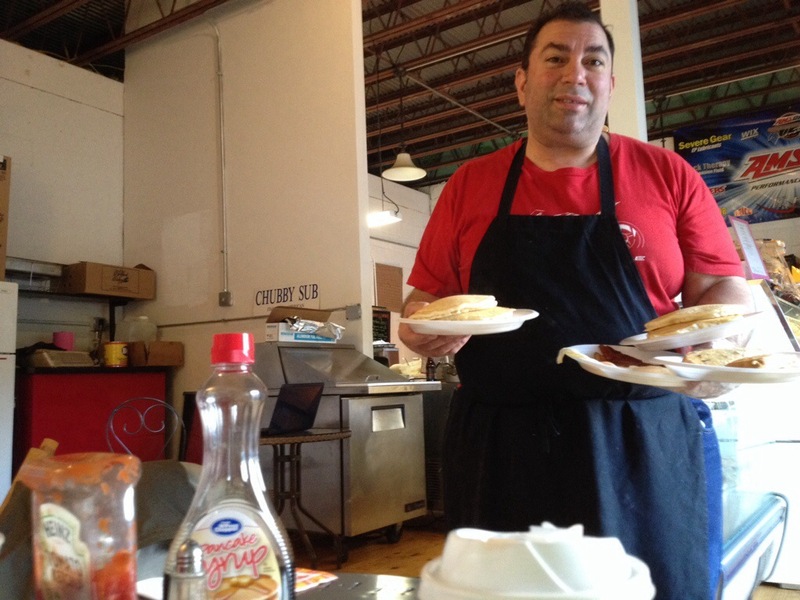 Since we had the extra time, our day started with a high octane pancake breakfast served with Italian charm. We loved it. 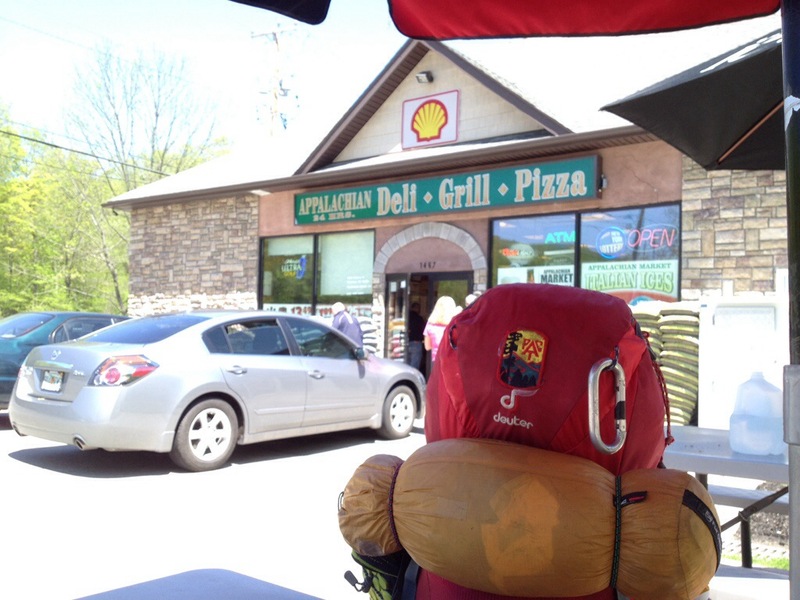 Next up at lunch time was the Appalachian Deli which is right on the trail. It is truly an amazing place. I gobbled an excellent plate of rigatoni with chicken for lunch. Washed down with Gatorade of course. The day was decent hiking with the exception that the trail was seriously waterlogged from the heavy rain overnight. 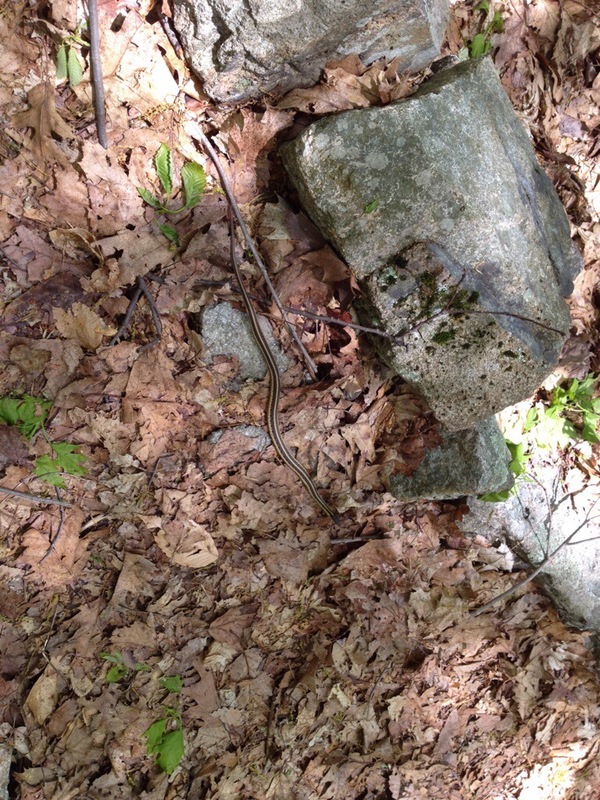 I did run into a friendly garter snake whose curiosity about me was amusing. This weekend is Trail Days in Damascus, VA. Thousands of hikers gather there. Hike for Mental Health, which I support, has a booth. I plan to write about the hiking and mental health tomorrow. It’s a propitious time to do it. I’ve missed several days of reading — I think you’ve hiked a state and a half since I last checked in. Jim and I “hiked” today. Our plan was to visit the wildlife refuge on the Mississippi River. Guess we did, technically. But all the hiking trails we intended to use were under water, as the river is high. We ate our picnic lunch high on the bluff, looking out across to Illinois. And we saw a couple of birds there we’d never seen, including a Magnolia Warbler and a Yellow Warbler. From there we backtracked to a town that has the confluence of two rivers. Neither is “large,” as in navigable by larger craft. But where they come together they’re pretty impressive. We found a county park on the bluff there, hiked down through a mud gully and then along an old railroad train bed, now used as a bike path. And then back up the mud gully. Again we saw a couple of new birds and a brilliant, iridescent green beetle. But no snakes! Lovely day to be out. We have the flooding in common. It’s rather soppy around here. The Alternative, for which this area is famous, is a lack if drinking water. I’m happy the way it is. I like the garter snake. Have a good day. Reviewed on Yelp and Trip Advisor. I have a friend who is a thru hiker on the Appalachian Trail who just ate at Danny’s Pizzeria. He was very disappointed in the tasteless pizza and surprised to find the management was anti-AT hikers. WOW! What are you Danny, NUTS? Unfortunately I removed the Yelp app among others to make more room for pics. I’ll write him up.